It takes a lot of time and practice to become a skilled rendering master. Mastering this profession is not an easy task, because one needs to know all the hidden hacks and tricks that make the quality of the renderings better. Here we present 6 tips which will help beginners get more realistic photo-renderings. 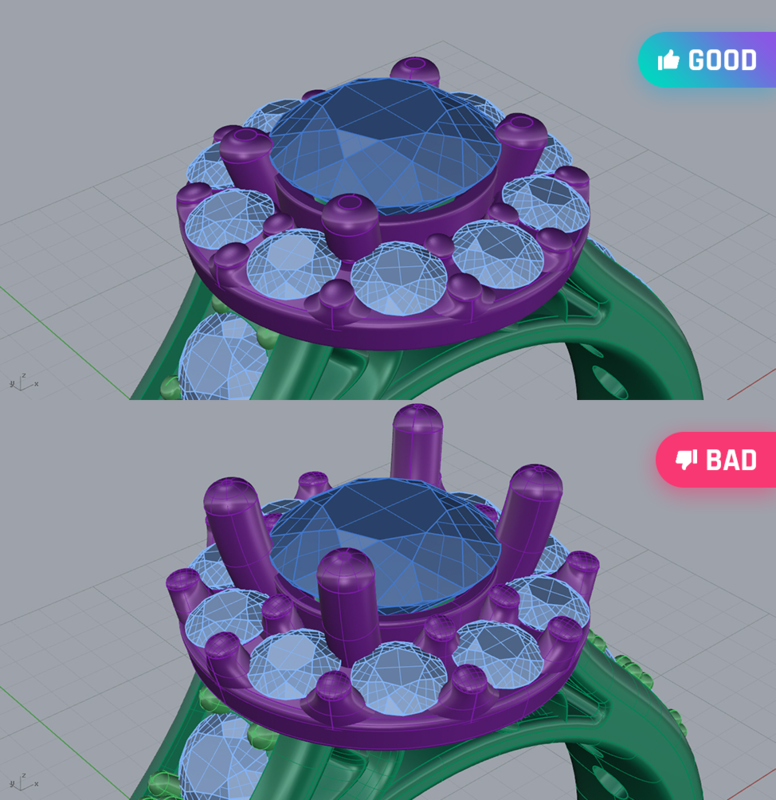 If your are working on a 3D model of a ring, that is created for the purpose of 3D printing, you have to make some changes on it. As this file is going to get 3D printed, the prongs of the ring are made longer. This helps the jewelry makers during the stonesetting process. With longer prongs, they are able to easily make the prongs go over the angle of the stone and create the pressure that holds the stone in place. So make sure to shorten the prongs of the ring, while rendering such files. In Rhino, when you design an object, it is set to have perfect angles, meaning that its edges have sharp angles. Unfortunately, such objects do not exist in real life. Even the sharpest knifes, in reality, have rounded edges. Moreover, even after printing the object with 3d printers, you will notice that the printed material has a slightly rounded edges. The secret to having the most realistic renderings is modeling the objects with a realistic geometry. Your job is to make a curvature angle of 0.1-0.3 radius. You have to fillet the angles, which are available to fillet, with 0.3 radius. The ones that are not available to fillet, have to be changed with either Z Rush or 3D coat. You just have to polish the metallic part of your model until you get the desired results. In the end, you will get a model that is more realistic, with realistic edges. Another important thing that is worth paying attention to is making the mesh polygons as invisible as possible, especially in the curved places. 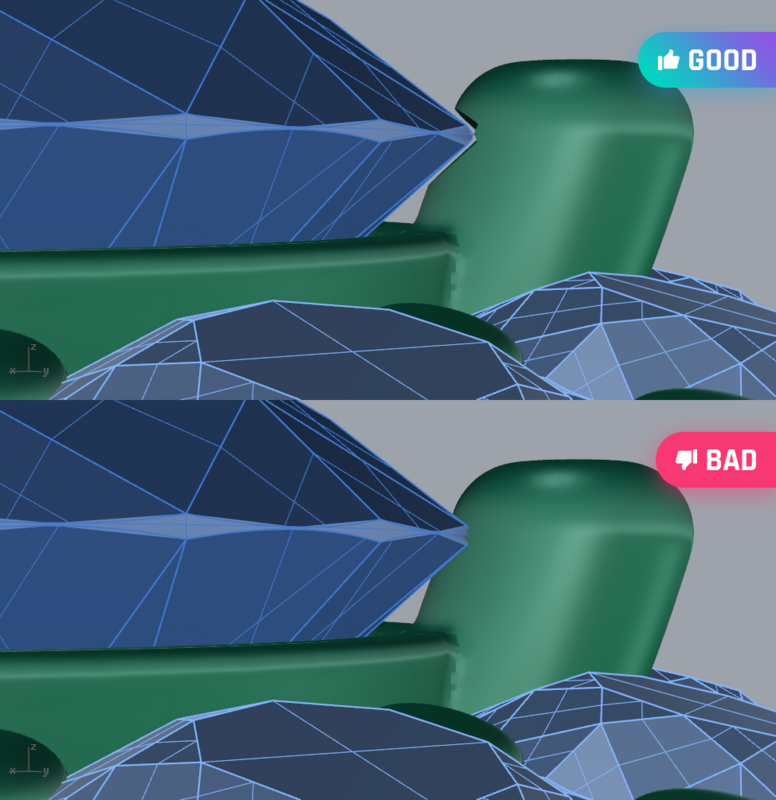 You have to make sure that the polygons are not visible when the object is in its shiniest state. To check that, you have to click on Surface Analysis section in Rhino, where you will find a tool called environment map. Afterwards, put a shader on your object and you will be able to see how it will look like in real life. If you notice any visible polygons during this process, just smoothen the surface of the object and make them invisible. Moreover, the more polygons you have the smoother the angles of the object will be, but on the other hand, the longer the rendering process will last. 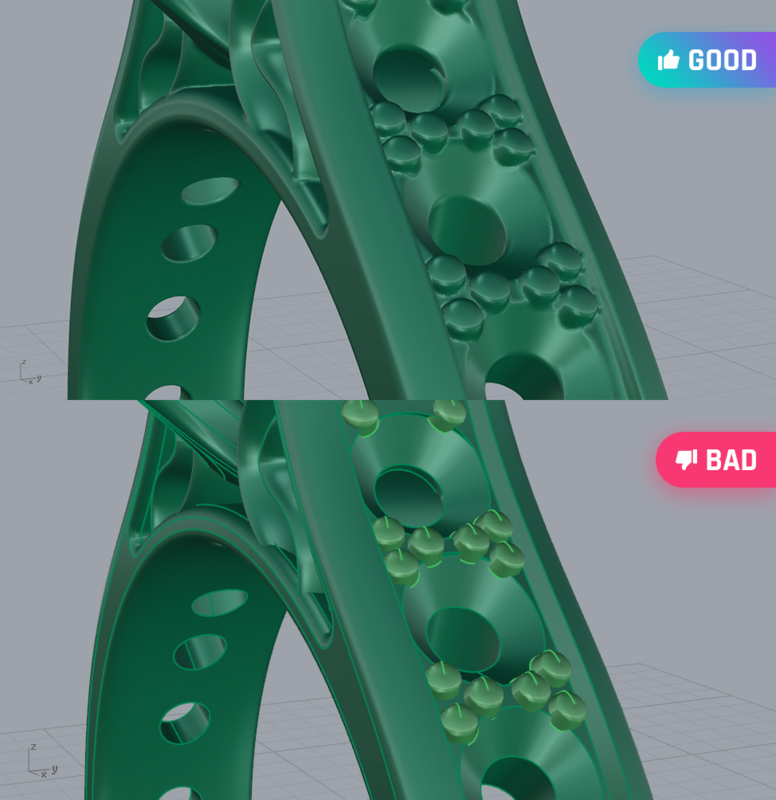 For this reason, depending on the model, the rendering master must find the optimal number of polygons that will make the angles smoother, but will not make the rendering process last a while. In real life, two or more objects cannot be put into each other, they can only be put next to each other. If you want to render a ring that has stones on it, then you must make sure that there are no objects that are intersecting with the stone. No object must be seen inside the stone. For example, when you are working on a stone of a ring that is intersecting with prongs, you have to make sure that the prongs are at least 0.01 millimeters away from the stone. To do this, you should duplicate the stone, keep the original version as it is and 3D scale the duplicate version by 1%. Then, you should perform a Boolean difference for the scaled version and delete it afterwards. This will leave you with the original stone that is not intersected with the prongs and a model that will end up having a more realistic rendered image. If you have duplicates in your model, the result of your renderings can turn out not as you wanted it to be, it will contain unnecessary noise . This may seem pretty obvious, but this is a really widespread problem and a lot of modelers are not being careful enough to notice the duplicates. So if you are curious about why your rendered model looks a little bit odd, be sure to check if there are any duplicates present. One thing you must also be careful with is making sure that the objects you are about to rend are whole. For instance, if you explode a stone, its geometric shape will stay the same, but it will not be a whole object anymore as it will consist of number of different surfaces. If you leave the object in its divided state, the rendering program will assume that it is not a single object, but different separate objects and the quality of your rendering will suffer. One must also be careful while rendering stones. You will get a realistic reflection and refraction only after having your object modeled with the right proportions, that will correspond to the real model you have in mind. Every diamond cut has some specifications you should follow, such as having the right proportions, facet angles and facet quantity. If the mentioned specificities are not set correctly, then your rendered image will have a non-realistic reflection and refraction. For example, diamond must have 57 facets, the crown of the diamond must have 33 facets and etc. You can always get info about the proportions the models should be rendered with, by simply Googling them. Selling Jewellery Online: A do or a don’t? © Rendline, 2019. All rights reserved.